The Good Doctor's Season 2 fall finale ended on multiple cliffhangers, leaving fans biting their nails over the futures of their favorite characters. 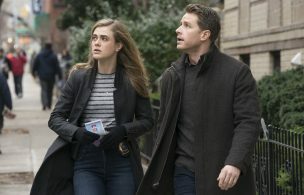 The episode was filled with high-stakes situations as an airborne virus starts spreading from two infected passengers from a flight from Malaysia. What's Next for Shaun & Lea on 'The Good Doctor'? The former neighbors have an undeniable connection. Lim (Christina Chang) and Melendez enjoyed a night together and certainly have no regrets. Sparks have been flying between the two characters all season long, so it was inevitable they finally got together. Bad news for Lim, though. She became infected with the lethal virus and collapsed while doing surgery. The even worse news is that the original patients from the flight (and the paramedic that treated them) didn't survive, so will she? How About Dr. Melendez's Patient? After his rendezvous with Lim, Melendez (Nicholas Gonzalez) is back at the hospital but finds out some bad news — his leukemia patient's bone marrow donor (who also happens to be his estranged father) is in quarantine. The patient's health is quickly declining and Melendez is torn up about what to do. Will Dr. Glassman Beat Cancer? Because of the quarantine situation, Shaun (Freddie Highmore) asked Lea (Paige Spara) to take Glassman (Richard Schiff) to his appointment and is faced with terrible news — his cancer is back. He must start his treatment plan all over again in an effort to battle this debilitating disease. Glassman has already had surgery to remove his brain tumor, which left him with memory loss and unable to drive. What About Dr. Park’s Son? Park's (Will Yun Lee) son is in the quarantine area and has a terrible asthma attack. Will someone be able to get to him in time during all this chaos?